There are trillions of cells in the human body, and each one needs nutrient molecules they can convert into energy or useful chemicals to survive, grow, and divide. Cells can get their “fuel” from a variety of sources, but the most common is the sugar glucose, which is abundant in foods like fruit and honey. When cells transform glucose into more useful molecules and energy, a common by-product is a molecule called lactate, which was considered to be an unimportant waste product for many years. Recent studies, however, have shown that certain types of cells have found a role for lactate. Last fall, two research articles were the first to provide direct evidence that cancer cells use lactate as fuel to grow and divide. Remarkably, this basic research finding that improves our understanding of how cancer cells use nutrients could also inform the design of our next batch of cancer drugs. Sugars like glucose are collections of carbon atoms, among other things. Just as the same planks of wood can be used to make different kinds of furniture, carbon atoms can be used to make different molecules. A process called a metabolic pathway describes the way that our body breaks apart sugar and re-purposes its carbon atoms. As cells consume glucose, they can change it through a metabolic pathway called glycolysis into a different carbon-based molecule called pyruvate (Figure 1). Pyruvate serves multiple roles: 1) it can be used to support a pathway called the citric acid cycle that produces energy and other important molecules, or 2) it can be converted to the molecule lactate. Figure 1: A basic overview of glucose metabolism in human cells. Glucose (purple) is taken up by a cell where it is changed to pyruvate (pink) via glycolysis. Pyruvate can then be used by the citric acid cycle to make energy, or it can be converted to lactate (green) and released from the cell. Lactate (not to be confused with the sugar in milk called lactose) is mostly studied in the context of the liver, where lactate can be converted back into glucose by the reverse of glycolysis. 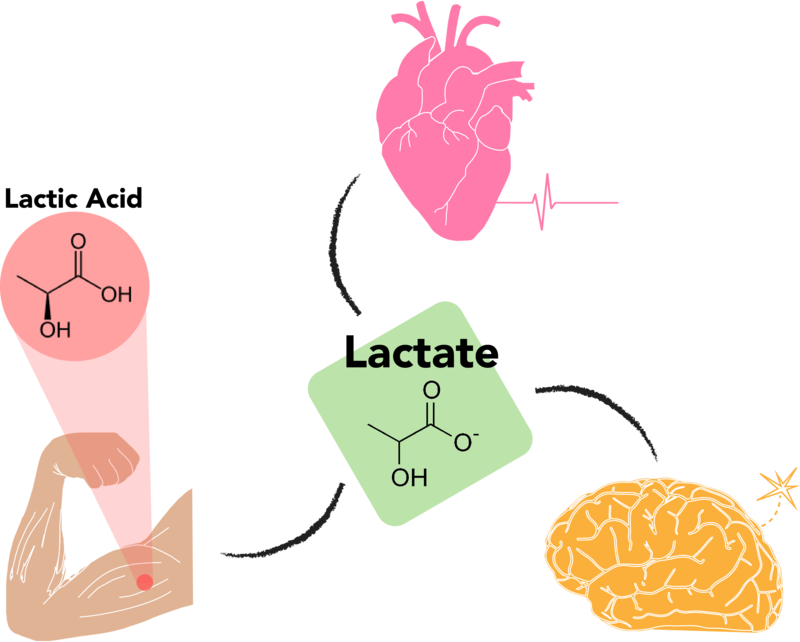 Outside of the liver, lactate can serve many useful functions, such fueling the heart, brain, and skeletal muscles (Figure 2). However, nobody had shown that cancer cells, which create and release lactate in large amounts, actually use it as fuel. Figure 2: Lactate plays many roles in the body. Lactate has already been shown to be used by organs like the heart, brain, and musculoskeletal system. Though healthy cells consume their fair share of glucose, cancer cells are particularly known for their sweet tooth, gobbling up glucose at an astounding rate. In fact, this phenomenon can be exploited in cancer diagnostics. Patients are given a special type of glucose that can be imaged using a medical test called a PET scan (positron emission tomography). Similar to how doctors can see bones from an X-ray, tumors can be seen as bright masses (Figure 3) because they collect such a large amount of the specialized glucose. So why does it matter that cancer cells are sugar addicts? By better understanding their preferences and dependencies (i.e. how they work) and by determining how they’re different from healthy cells, researchers are one step closer to developing better treatments for cancer patients. While much of what scientists understand about glucose’s role in supporting cell growth applies to both healthy and cancerous cells, there are some important differences. 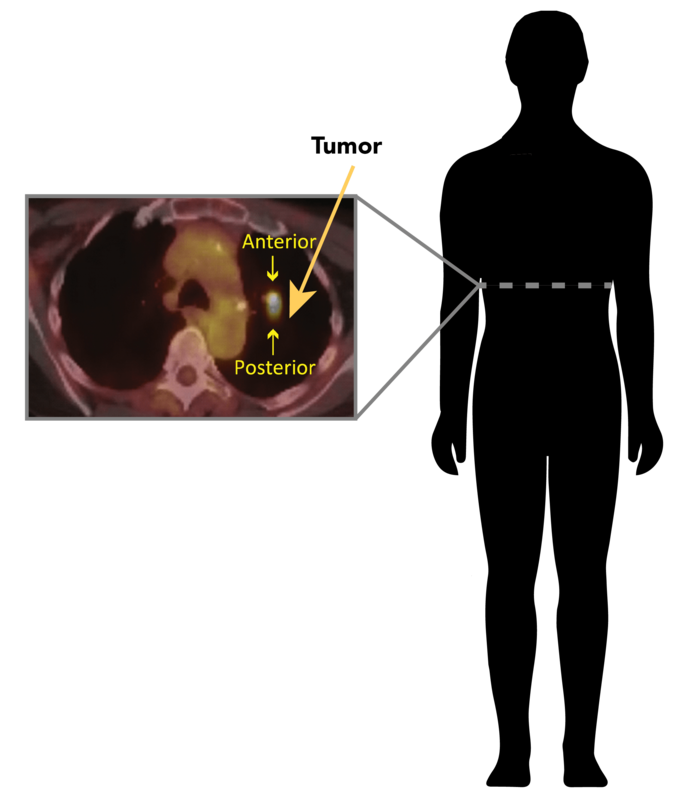 Figure 3: Positron emission tomography (PET) can be used to detect cancer. The PET scan on the left is showing the abdomen of a patient looking down from the top of their head. The bright spot indicated by the arrows is a tumor. Cancer is defined by uncontrollable cell growth and division, so cancer cells need the building blocks and energy to make new cells much faster than healthy cells do. Therefore, they rely heavily on the glucose and rapidly convert it to pyruvate via glycolysis. Back in the 1920s, it was discovered that cancer cells prefer not to rely on the citric acid cycle like healthy cells do. Instead, they turn most of their pyruvate into lactate, which they then release. And because cancer cells consume so much glucose, they end up producing a lot of lactate. Two independent research teams were recently the first scientists to show that cancer cells use lactate to grow. One team, led by Dr. Ralph DeBerardinis at the University of Texas Southwestern Medical Center, looked at lung cancer patients and their surgically removed tumors. 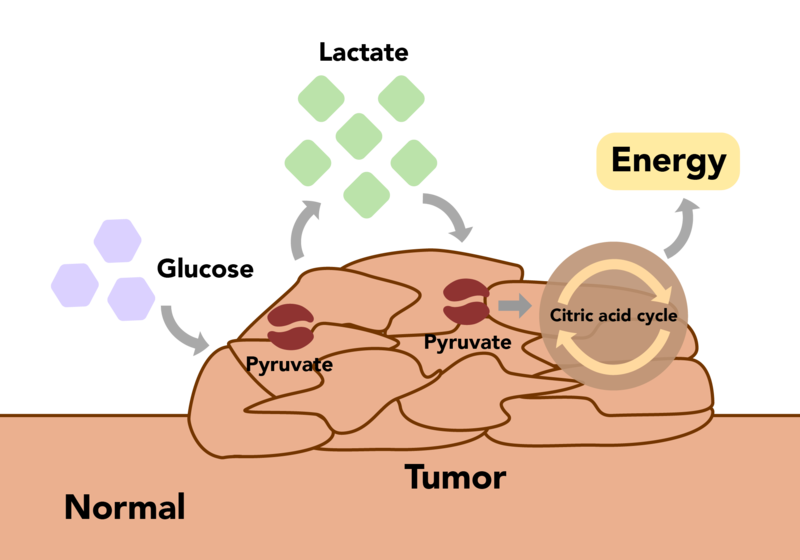 The team found that the lung tumor cells took lactate from the blood and turned it back into pyruvate to support the main metabolic pathway preferred by healthy cells: the citric acid cycle (Figure 4). These studies were the first to show that lactate, not just glucose, can be used as a source of fuel for the citric acid cycle. Figure 4: Tumors both release and capture lactate. In a tumor, pyruvate (red) is converted to lactate (green) and released from cells. At the same time, lactate is taken from the blood stream and turned back to pyruvate inside the cells. The pyruvate is then used in the citric acid cycle to make energy. In a separate set of experiments, a team led by Dr. Joshua Rabinowitz at Princeton University took an in-depth look at how cells, both healthy and cancerous, could use lactate. While studying both healthy mice and mice with lung and pancreatic cancer, they observed that lactate was collected from the environment to make the same types of molecules that were seen in the DeBerardinis experiments. This result suggests that lactate taken from the blood is being used in the citric acid cycle. The researchers also claim that almost 40% of glucose is first converted to lactate and released into the blood. That lactate is then consumed by other cells in the body to be changed back to pyruvate to be used in the citric acid cycle. It may seem counter-intuitive that lactate is released just to be taken up again, but converting pyruvate into lactate allows cancer cells to focus solely on glycolysis. Notably, in addition to producing pyruvate as an end-product, glycolysis also generates many other molecules along the way that are important to the cell, which may be one of many reasons why cells simultaneously excrete lactate and sequester it from the blood. By better understanding how cancer cells use nutrients to support tumor growth, new therapies could be generated in the future against the pathways on which cancer cells depend most. For example, studies have shown that specific types of cancers rely upon a molecule called glutamine as a nutrient source, making glutamine breakdown a very important pathway in cancer cells. Researchers exploited this finding to develop drugs that are now showing promising preliminary results in clinical trials. Though the use of lactate is not specific to cancer cells, the idea that cancer cells can reuse molecules that had previously been considered waste products is significant. In fact, another recent study looking at another “waste” molecule that can be recycled to support breast cancer growth was recently published. Finally, this line of research could also extend beyond cancer to metabolic diseases like diabetes in which there is too much sugar in the blood. By continuing to learn more about how cancer cells use available nutrients like glucose and lactate to support tumor growth, researchers can better serve cancer patients in the future. Lara Roach is a second-year Ph.D. student in the Biological and Biomedical Sciences program at Harvard University.